February 22, 2019 (Charleston, SC) - Rising heartland-rockers The Artisanals have just announced dates for their 2019 North American spring tour. The quintet proudly released their debut self-titled album The Artisanals last fall and have been relentlessly touring ever since. They started off the year with a four-week tour throughout Europe, and in two weeks, they will begin their North American spring tour. The new run begins with theSavannah Stopover Music Festival where they will share the stage with Deerhunter and former bandmates Susto. Throughout March and April, they will journey along the southern states and into the midwest before returning to the southeast. 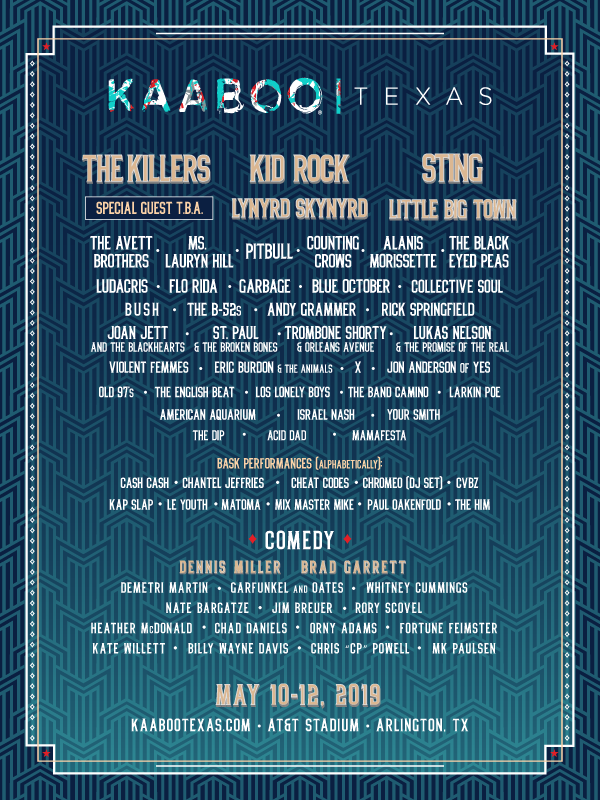 Arlington, TX (January, 16th, 2019) - KAABOO is pleased to announce its 2019 music and comedy lineups for KAABOO Texas taking place May 10-12, 2019. The multi-stage and full sensory event will happen at the state-of-the-art AT&T Stadium and take place both inside and outdoors allowing guests to move freely throughout the property. Headliners including rock chart toppers The Killers, Top 40 crossover artist Kid Rock, 16-time Grammy award winner Sting, will be joined by classic Southern-Rock legends Lynyrd Skynyrd, and platinum-selling country music artists Little Big Town. Additional hitmakers and bucket list artists include The Avett Brothers, Ms. Lauryn Hill, Pitbull, Counting Crows, Alanis Morissette, The Black Eyed Peas, Ludacris, Flo Rida, Garbage, Andy Grammer, Joan Jett and the Blackhearts, Violent Femmes, Trombone Shorty & Orleans Avenue, and many more. KAABOO’s HUMOR ME stage will be headed up by Saturday Night Live cast alum Dennis Miller, Everybody Loves Raymond’s Brad Garrett, and more. A full lineup of confirmed performers is below. Single day passes now on sale for KAABOO Del Mar, happening September 14-16th, 2018 in Del Mar, CA. Performances from Foo Fighters, Halsey, Incubus, + more Friday night, Imagine Dragons, N.E.R.D, and Earth, Wind & Fire + more on Saturday, and Katy Perry and Robert Plant and the Sensational Space Shifters to headline on Sunday. Heartland Rock/ Alt-Americana quintet The Artisanals will be hitting the road and heading out west with a string of tour dates this summer. The recently formed Charleston-based band fronted by Johnny Delaware (formerly of SUSTO), has previously toured with heavy hitting Americana mainstays like Band of Horses, Dylan LeBlanc and Roadkill Ghost Choir, although this run will mark their first headlining tour. The band will be touring on the heels of their four-track EP Literally, Anywhere (released September of 2017), and teasing audiences with tracks from their forthcoming full-length album release (fall date TBD). A complete list of confirmed show dates can be found below with more dates to be added soon. All-pro ensemble The Nth Power have crafted a collection of new songs featuring their signature soul, funk and R&B sound and are inviting fans take part in the recording process. WayHome Music and Arts Festival has announced their lineup by day including LCD Soundsystem (Friday, July 22nd), Arcade Fire (Saturday, July 23rd), The Killers (Sunday, July 24th) and more. The second annual festival takes place July 22 - 24, 2016.